When the ball crosses the sideline and leaves the field of play, the team who did not touch it last brings the ball back into play via a shie, also known as a hit-in. There are some very specific rules about shies, so it is important to learn this technique correctly. With feet about your about a shoulder's width apart the player making the shie stands perpendicular to the sideline with their feet on the touch line itself. Hold the caman in one hand in front of your body, and with the other hand toss the ball up in the air. The ball is tossed up so that if unimpeded it would land directly in front of the player or even on his head. As the ball is coming back down the player brings the caman directly over their head and strikes the ball with the flat back of the stick. 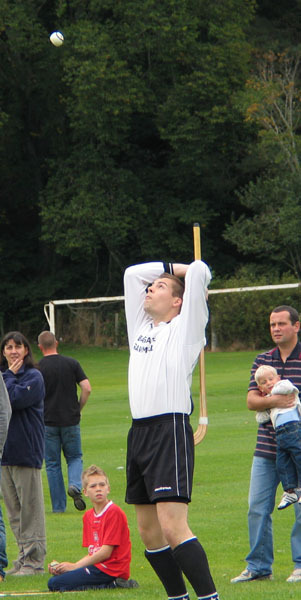 It is extremely important to bring the stick directly over the head (think of a throw-in in soccer) because any deviation from this (hitting from the side or bringing the stick over the shoulder) will result in a foul and a change in possession. Flex your knees a little while making the throw, and remember that you can make as many throws as you need so long as no attempt is made to swing at or hit the ball. This is important because often it can take a toss or two to gauge the wind and the angle of the sun. TIP: For beginners we recommend that you choke up significantly on the stick while getting comfortable with the shie. As you improve you can move your hands further down the stick and thereby gain more force on your hits. As you can see by the center and right hand photos above (taken on a recent trip to Scotland) as you get confident you can take a large backswing! 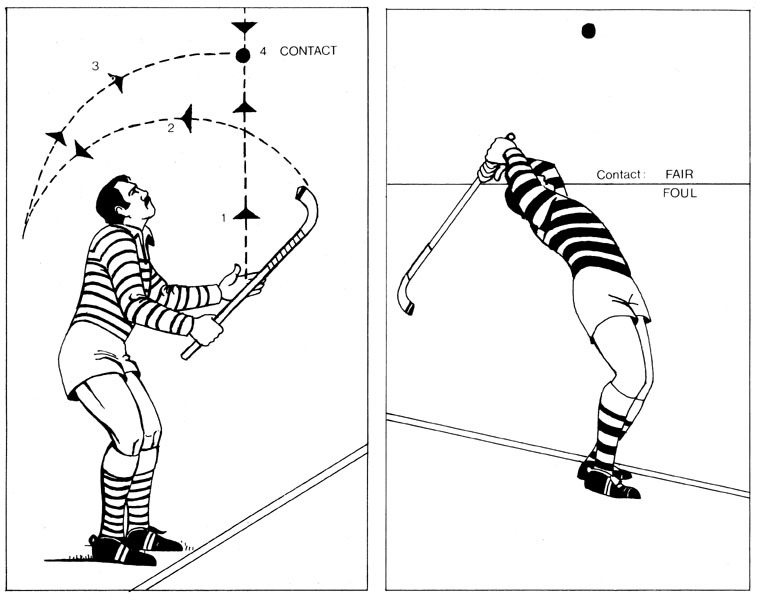 Below is a diagram from the Camanachd Association Coaching Manual published ca. 1980, it may help clarify the complete technique. Notice that contact with the ball must be made above head height.